Serra Mazda, Making a Difference! In their original incarnation, SUVs were chiefly owned by folks who valued "utility" above "sport." Not anymore! The Toyota Sequoia Ltd redefines the SUV and makes the perfect "all around" family companion. You appreciate the finer things in life, the vehicle you drive should not be the exception. 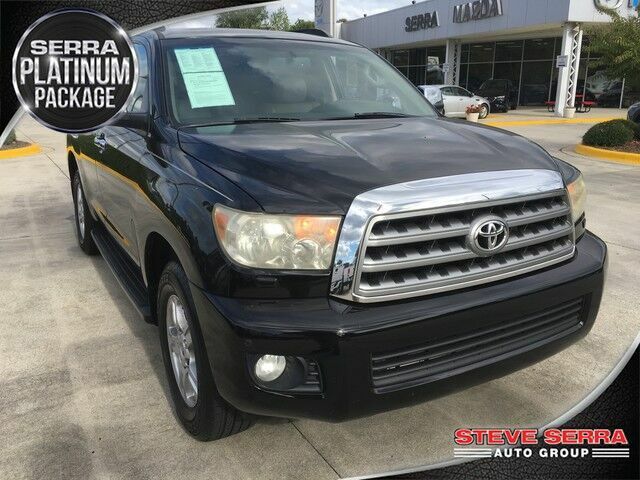 Style, performance, sophistication is in a class of its own with this stunning Toyota Sequoia. Equipped with 4WD, this Toyota Sequoia gives you added confidence to tackle the surface of any path you take. More information about the 2008 Toyota Sequoia: With a choice of two V8s, rear- or four-wheel drive, and a spacious, quiet, comfortable interior, the 2008 Toyota Sequoia is a solid alternative to the Tahoes, Suburbans, Expeditions, and Armadas of the world. Its handsome exterior styling reflects its truck-based mechanicals, yet its civilized road manners play a big part in the Sequoia's appeal. When properly equipped, it will haul up to eight people, their things, and their 10,000-pound boat with ease. Interesting features of this model are quiet ride, Attractive styling in keeping with rugged Tundra underpinnings, excellent cargo space and towing capacity., roomy, comfortable interior, and 4.7L or 5.7L V8 power For additional information, please visit www.serramazda.com or call 205-655-7301 to schedule an appointment.